When we think of Peony Avis Varner, we can see them in front of us with our eyes closed. To us, this is the ultimate purple peony on the market. We are looking forward to the two weeks per year that we can get them back in our assortment. Avis Varner is a big eye-catcher. Who do we owe this visual craving to? To our breeder Ferdinando: without him, we would never have known that this species exists. He truly showed us how amazing this peony is. We are really pleased that the market and our customers are acknowledging the beauty of this flower as well. Hopefully, this peony will be discovered by even more peony fans and breeders in the future. Avis Varner was discovered in 1981 by Steve Varner. It is slowly but surely entering the market as a cut flower peony. Avis Varner is a purple peony who needs more power to open up. Raw harvesting is really not done for this flower. 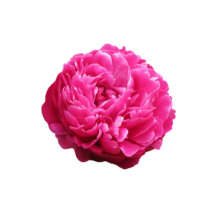 If you are looking for peonies that are nicely sealed so that they stay in place for a long time, this peony is not the one for you.